Leave everyday life behind you and spend a few fantastic days in the alpine-mediterranean holiday flair of the Merano region, in Marling. Enjoy the beautiful natural landscape, the lively spa town of Merano with its numerous sights and discover the variety of leisure activities. Including the BusCard Merano & surroundings - your advantage card for public transport if you want to explore the Merano countryside by bus! Lavish breakfast buffet with a wide selection of homemade cakes & sweet treats, jams produced according to our own recipe, varied platters of cold meats and cheeses, tasty egg dishes, a variety of mueslis, bio corner, fresh fruit and vegetables and much more. 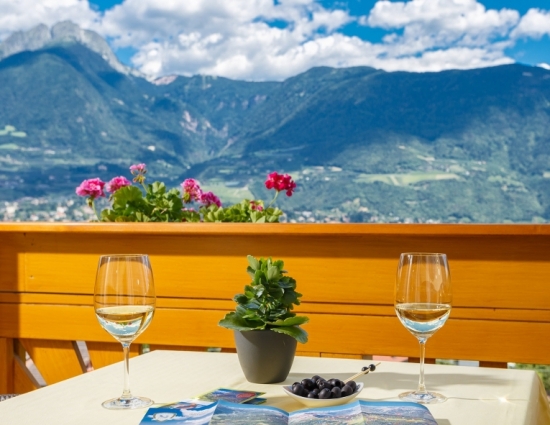 Merano fascinates with numerous sights, Mediterranean climate and alpine landscape: This perfect symbiosis makes a holiday in the Merano region a special pleasure! The Austrian Empress Sissi and the writer Franz Kafka already loved this harmony. In Merano and its surroundings, both those interested in culture and active sports holidaymakers will find a wide range of possibilities. The Landhaus Hotel Kristall in Marling is the ideal starting point for exploring and visiting the sights in Merano and the surrounding area. Offer valid subject to availability. We ask for your understanding that our offers are not cumulative and can be transferred to bookings already made.